Shashi Tharoor, 63, remained active on social media despite being admitted in hospital and getting six stitches on his head. He was back on the campaign trail after he was discharged. Election 2019: Congress candidate Shashi Tharoor was discharged from hospital on Tuesday. "Thank you @rajnathsingh for your call. I am touched by your concern. By the grace of God I am well enough to be back in action," Mr Tharoor tweeted. Shashi Tharoor, 63, remained active on social media despite being admitted in hospital and getting six stitches on his head. Replying to Rajasthan Chief Minster Ashok Gehlot's wishes on Twiter, Mr Tharoor said he is "well on the mend and back in action". He was discharged from hospital yesterday and was back on the campaign trail. 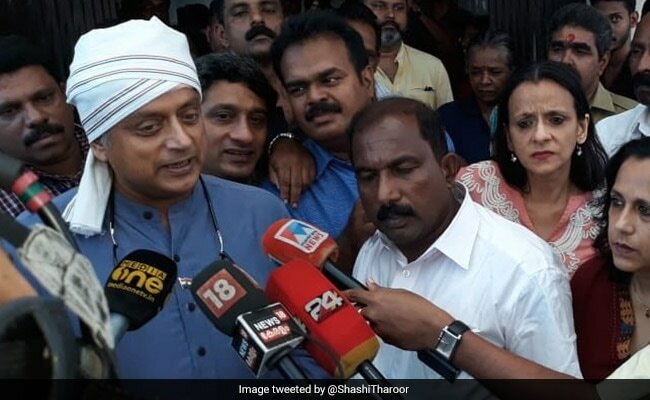 Mr Tharoor was injured on Monday during a ritual called ''thulabharam'', in which a person is weighed against flowers, grains, fruits and similar items in temples and the equal value or quantity is offered as donation. While he was sitting on one of the pans of the weighing scale, the hook came off and its iron panel fell on his head. Defence Minister Nirmala Sitharaman was the most high-profile visitor at the Thiruvanthapuram hospital. Mr Tharoor tweeted a picture of the minister visiting him in his hospital room. "Civility is a rare virtue in politics," he posted, sharing a photo with the minister and top BJP leader in his hospital room. Head bandaged and covered in a traditional mundu, he joined Congress president Rahul Gandhi in his campaign in the state capital yesterday. The Congress leader won his boss's praise for joining him despite his injury.